Moving fireproof cabinets, safe and lockers! Fully trained and equipped safe removal company in London. Cheap and local safe movers. 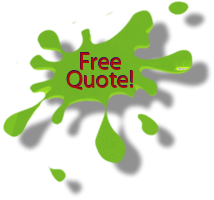 - Contact us for your free safe removal cost. The quote is with no obligations. We move small and large, heavy saves up to 10 ton. Transportation of heavy goods, such as safes or fire proof filing cabinets is one of the most difficult issues related to the sale and purchase of these products. 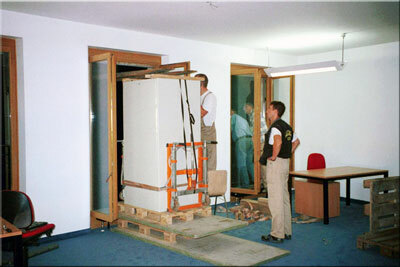 Moving a safe is also quite an issue during office removals especially if the large and heavy safe has to be lifted and carried up or down the stairs. In spite of appearances, mainly due to the large size and the weight, safes during the move are extremely vulnerable to damage. To tell the truth the damages, accrued during the move, do not reduce the usage value of the safe but largely they affect its aesthetics. Safes are covered with a varnish powder coating which prevents the safe from getting dirty and make it easy to keep it clean. Unfortunately the varnish is vulnerable to breakage and scratches. In addition, the edges of the safes during the removal are particularly vulnerable to abrasion of safety belts. On the other hand it must be remembered what will not damage the safe will damage the wall, door, floor or stairs. Therefore the safe removals must be planned and prepared with at most care. It requires adequate preparations, protections and safety measures. Our safe removal company in London attach special importance to the proper preparation when planning a safe move. 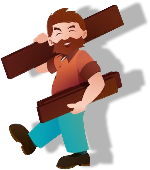 Regardless of whether you decide to transport the save using our trained and properly equipped movers, or whether you choose a cheap man and van in London, in every situation, you should be 100% confident that the safe will be picked up and delivered in a good condition. When choosing a fireproof filing cabinet removal firm in London make sure your safe mover has extensive experience, safe moving equipment an know how to use them. If you are interested in services related to the transportation of safes, both new and used, we encourage you to contact us for further information. We are a trusted mover of safes cabinet for businesses, dental practises, heads of offices and public institutions and authorities. Wherever prestige and aesthetics are important, our safe removal services will be the perfect complement to the aesthetics of the interior of any office. We can also advice you on the safe rental, leasing and disposal. No safe is too small or too big to be moved by our moving experts. We can operate safe removal equipment designed to move large objects up and down the stairs. 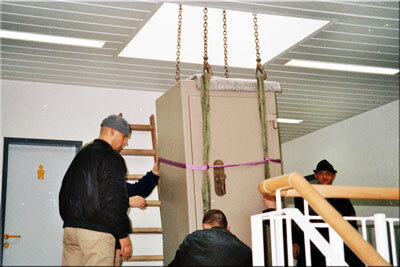 We can also use hi-abs and hoists for moving the safes through the window or balcony if no other access is available. So London safe removals can do any job at local and cheap prices. Carrying vaults or metal lockers up or down two, 3 of even fife flight of stairs is not a problem for us.